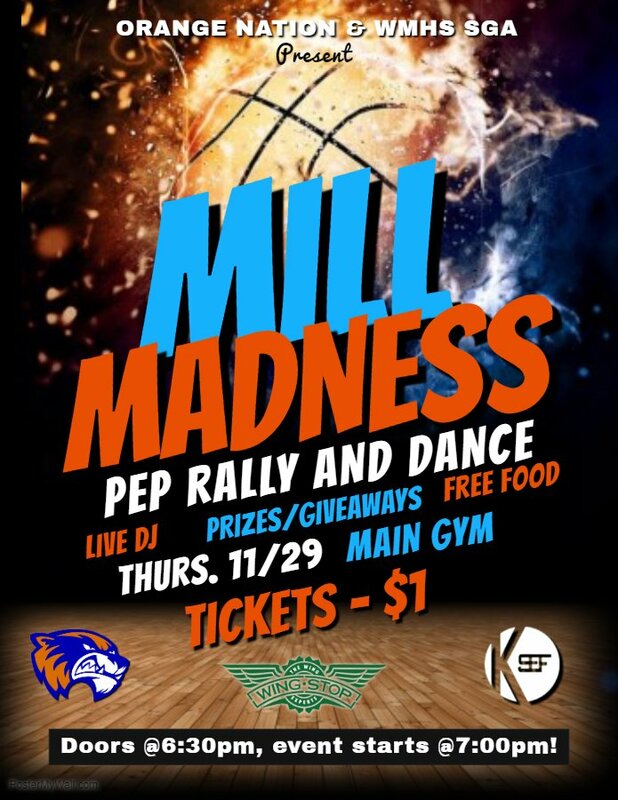 Mill Madness is about to take off, so come out to the main gym Thursday, November 29 at 6:30pm to enjoy the pep rally put on by Orange Nation. Mill Madness is a school event with a live DJ and dance. Students will also be able to participate in giveaways and eat food provided by Wingstop. Giveaways for the pep rally include spirit wear such as Watkins Mill hoodies, t-shirts and much more. At only a dollar per ticket, Mill Madness offers students a cheap and safe option to celebrate the school and all the hard work put on by sports teams. “This event is especially cool because it’s after school and Wingstop is catering,” Flandrau added. “I think it’d be really fun to go to these things,” freshman Shelby Aguilar said. “It’d be my first time going to one of these events as a high schooler, so it’s pretty cool.” Mill Madness is a favorite school event for students. It offers an opportunity to explore how spirited the Mill is. All the events taking place at Mill Madness are school sponsored. With food from Wingstop and a DJ, there is no excuse to not go! Mill events are fun for all students. Be sure to wear your class colors to show off your Wolverine pride! What time does mill Madness end?